Paul Burman was only 40 years old in 1928 yet he had been extraordinarily productive in terms of his creative work. Burman’s talent was also sufficiently appreciated by critics and among artists. Burman had studied at many different establishments (Ants Laikmaa’s studio school, additionally in St. Petersburg, Moscow, Riga), and he also travelled a great deal (Paris, the Crimea, Germany) and participated in numerous exhibitions. From 1918 until his death, however, he received continuous treatment at a mental hospital. Burman continued to paint there, whereas for the most part, his themes, subjects, style as well as his attitude remained unchanged: animals, landscapes, nature as such. Burman practically did not work at all in 1920-1922 according to the notes of his physician. The joy of creation reportedly cropped up in him only thereafter, which was also reflected in his colours becoming brighter. At the same time, moods of sadness also become much more prominent now. Burman started to prefer autumn and winter motifs as his subjects. His depictions of the sky included more clouds. He also started using the colour black for the first time. The year 1928, however, is a period where Paul Burman’s creative work livens up. All at once, he started dating his works, which Burman generally did not do, and he once again painted quite extensively. His colours became lighter and brighter again and his subjects became simpler. It has been speculated that Paul Burman did not entirely understand the details of his stay in the hospital for treatment and that his works completed in the hospital are therefore frequently in milder tones. 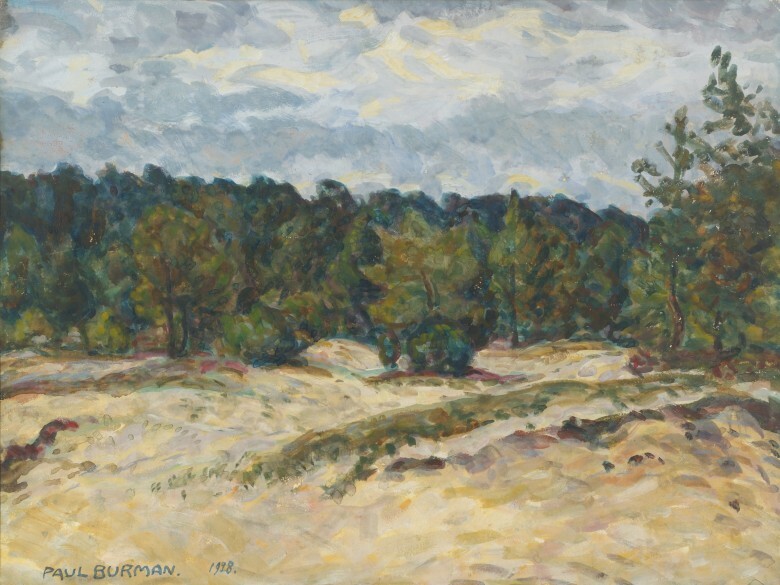 The hospital was situated in a natural park and beyond the park were fields of grain and pastures with woods further in the distance, which and where Burman often painted and which "Cloudy Day" also apparently depicts. "Burman left home with his painter’s case and plywood boards or pasteboards and when he had found a suitable place to sit, either on a rock or a stump, he got down to work," wrote a researcher of Burman’s creative work. He worked very quickly and intensely, and as a rule, he did not finish his works in the studio. For instance, recollections indicate that a quarter of an hour to an hour was enough for Burman to complete a painting. Paul Burman was a patient at a mental hospital at the time that this painting was completed. Since he was a voluntary patient, so to speak, the hospital’s chief physician, who was also a supporter of Burman, allowed him to undertake long walks that extended farther afield from the territory of the Seewald mental hospital located at the beginning of the current Paldiski Highway. Thus several views of Tallinn’s Old Town by Burman are known, for instance, but Burman also got as far as Pirita on his painting excursions. 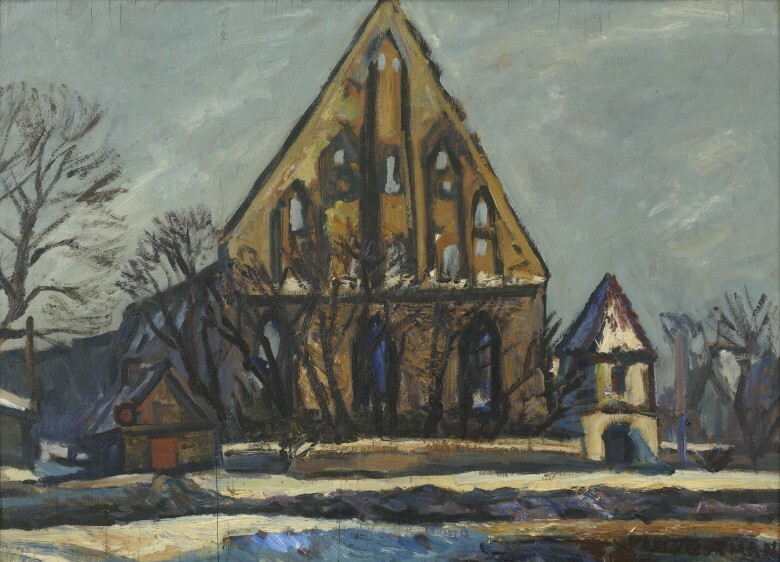 Several more views of Pirita Abbey are known to have been painted by Burman, since it apparently charmed him with its architectural distinctiveness, but also with its romantic atmosphere, which suited Burman’s emotional nervous system. “Burman left home with his painter’s box and sheets of plywood or pasteboard, and when he had found a suitable place to sit on a rock or a stump, he set to work,” wrote Aino Kartna. Jaan Koort’s widow Mari Koort has recalled that when she was in Paris with Paul Burman, a quarter of an hour to one hour was enough for him to finish a painting. He had worked continuously like that, looking at what he was depicting in nature or in the city. Paul Burman is known first and foremost as a painter of animals, but several cityscapes of his are also known. 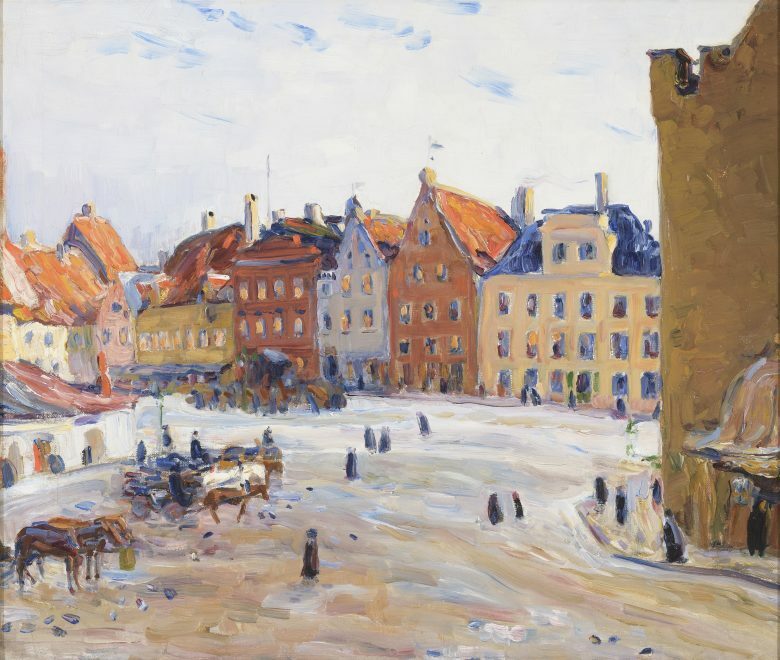 This painting depicts Tallinn’s Town Hall Square, but in place of architectural precision, he was interested more in colours. The laconic Old Town is conveyed by way of houses of different tones. The snowy square and the sky full of white clouds stress the boldness of their tones even more by forming a background that intensifies those colours. People are depicted only by way of small brushstrokes, but even here Burman has not gotten by without horses, his favourites. Even though Burman’s own disposition was very restless, which was among other things expressed by the fact that he painted very quickly, this work inspires a sense of peace and standing still in the midst of a dynamic world.